In this study, short-term slow slip events (SSEs) along the Ryukyu Trench, southwestern Japan were systematically examined using continuous global navigation satellite system (GNSS) data. In total, 130 probable and 93 possible short-term SSEs in the moment magnitude (M w ) range of 5.6 to 6.8 were identified from January 1997 to November 2013 by GNSS time series offset monitoring and elastic dislocation modeling with a rectangular fault located on the subducting Philippine Sea Plate. The detected short-term SSEs were found to have a variety of characteristic recurrence intervals, magnitudes, durations, and coincidental seismic activities. Short-term SSEs without identified low-frequency earthquakes (LFEs) and low-frequency tremors (LFTs) were found to be common along the Ryukyu Trench. The total slip distributions and SSE numbers were heterogeneous and mostly between 10 and 60 km in depth. Although shallow (depth ≤20 km) short-term SSEs have never been detected along the Nankai Trough, it was notable that such SSEs often occur on the shallow plate interface along the Ryukyu Trench. This may be related to the incomplete interplate locking estimated by various geodetic studies. A band of short-term SSEs in the 20 to 40 km depth range extends from west Shikoku through the Bungo Channel to mid-Kyushu and then fades away around the subducted Kyushu-Palau Ridge. SSEs with accompanying LFEs and LFTs were found to be limited to western Shikoku and the Bungo Channel. We found several distinctive clusters of short-term SSEs, in addition to a cluster previously identified in the Yaeyama Islands. The study also identified a cluster northeast of Kikaijima consisting of 20 repeated SSEs at depths in the vicinity of 10 km near the trench where the Amami Plateau subducts, as well as another cluster southeast of Okinawa Island consisting of 29 M w ≤ 6.0 SSEs. The results suggest that the distribution of short-term SSEs, as well as that of large earthquakes, is affected by the topography of the subducting plate. Slow slip events (SSEs) have been observed in subduction zones worldwide by geodetic instruments (cf., Schwartz and Rokosky ; Beroza and Ide ; Nishimura et al. ). 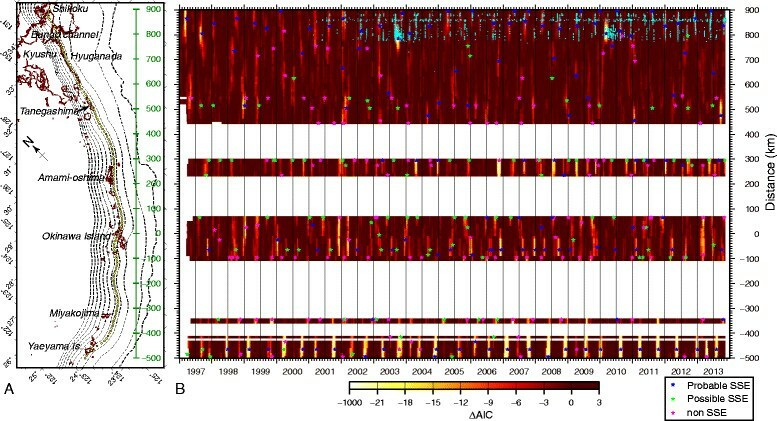 Because dense geodetic networks have revealed numerous repeated SSEs in the circum-Pacific seismic belt (e.g., Obara and Hirose ; Szeliga et al. ; Wallace et al. ; Ozawa et al. ; Ozawa ), they have come to be regarded as playing an important role in releasing strain in subduction zones. Reported SSEs have shown wide variations in source duration, magnitude, and depth, and we do not yet fully understand which condition(s) controls their behaviors. Slow earthquakes, including SSEs, low-frequency earthquakes (LFEs), low-frequency tremors (LFTs), and very low frequency earthquakes (VLFEs) along the Nankai Trough, which is located southwest of Japan, have been investigated by numerous researchers (e.g., Hirose et al. ; Ozawa et al. , ; Obara , , ; Ito et al. ). Non-volcanic deep LFTs and LFEs occur in a narrow band at depths of 30 to 45 km, presumably on the plate interface (Obara , ). In this research, we eliminate the distinctions between LFT and LFE distributions because deep LFTs consist of deep LFEs (Shelly et al. ). Numerous LFEs form a band in western Shikoku and the Bungo Channel (Figure 1), and short-term SSEs with durations ranging from a few days to a few weeks often occur in the LFT band of these regions (Obara and Hirose ; Sekine et al. ; Nishimura et al. ). Short-term SSEs accompanying LFTs are called episodic tremor and slip (ETS) events (Rogers and Dragert ) and repeat at an interval of approximately 6 months in western Shikoku, while long-term SSEs with durations of several months to a year occur in the Bungo Channel and western Shikoku (Hirose et al. ; Kobayashi ; Ozawa et al. ). 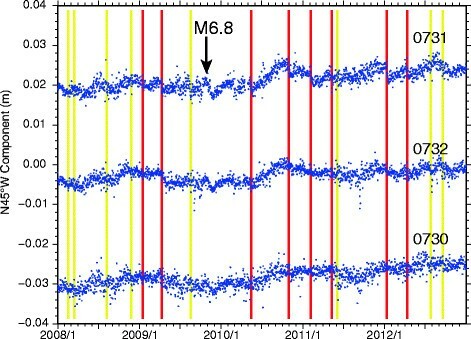 Long-term SSEs with moment magnitude (M w ) ranges of 7.0 to 7.1 were observed by global navigation satellite system (GNSS) in the Bungo Channel (Figure 1, region A) in 1997, 2003, and 2010. These long-term SSEs occur up-dip of the short-term SSEs at depths of 20 to 30 km if they both occur on the plate interface. In contrast, studies on slow earthquakes are very limited along the Ryukyu Trench, which is the southwest extension of the Nankai Trough. LFEs near the plate interface are also rare in Kyushu (Yoshioka et al. ; Yabe and Ide ), and the Japan Meteorological Agency (JMA) has not identified any LFEs from Tanegashima to the Yaeyama Islands along the Ryukyu Trench (Figure 1). However, recent studies have revealed that numerous VLFEs occur along the Ryukyu Trench (Ando et al. ; Asano et al. ), and while this occurrence frequency suggests frequent SSEs occurrences as well, SSEs have only been reported in two cases. The first involved short-term SSEs that occurred in the Yaeyama Islands, located in the southwestern most part of the Ryukyu Trench (Figure 1, region C) (Heki and Kataoka ), which showed the distinctive feature of biannually repeating M w ~ 6.6 SSE events with durations of approximately 1 month. The second case involved southeastern Kyushu (Yarai and Ozawa ), where long-term SSEs repeated in the afterslip region following M w 6.7 and 6.8 interplate earthquakes in 1996 (Figure 1, region B). Each of the SSEs released a moment equivalent to a M w 6.8 event over a period of about a year. The limited number of reported SSEs can probably be attributed to the lack of systematic searches for such events throughout the Ryukyu Trench region, even though Nishimura et al. () did perform such a search along the Nankai Trough using GNSS data. Map of the area studied along the Ryukyu Trench. (A) GNSS stations used along the Ryukyu Trench. Blue dots indicate used GNSS (GEONET) stations. Red dots are epicenters of low-frequency earthquakes (LFEs) determined by the Japan Meteorological Agency. Yellow stars indicate epicenters of large earthquakes whose coseismic displacements were removed from the analysis. The orange triangle indicates the location of the Kirishima volcano. Broken lines are isodepth contours of the subducting Philippine Sea Plate with a contour interval of 10 km. Red arrows indicate motion of the Philippine Sea Plate relative to that of the South China Block (Sella et al. ). (B) Bathymetry along the Ryukyu Trench. Although the Philippine Sea Plate subducts beneath both the Ryukyu Trench and Nankai Trough, the subduction zones along both have several different seismo-tectonic aspects. For example, the rate of relative interplate motion along the Ryukyu Trench predicted by a global plate model (Sella et al. ) is 70 to 91 mm/year, which is faster than the approximately 60 mm/year rate predicted along the Nankai Trough. Additionally, active spreading within the overriding plate proceeds only in the back-arc (the Okinawa Trough) region of the Ryukyu Trench (Letouzey and Kimura ; Nishimura et al. ) and causes the long-term slip rate to increase at the subduction interface. Furthermore, while M w 8 to 9 megathrust earthquakes are known to have occurred repeatedly with an interval of 100 to 200 years along the Nankai Trough (e.g., Ishibashi ), the history of such events along the Ryukyu Trench is poorly understood. Possible megathrust earthquakes in documented history include an M w ~ 8 event northeast of Amami-oshima in 1911 (Goto ) and an M w 7.4 to 8 event south of the Yaeyama Islands in 1771 (Nakamura , ). While the latter caused devastating tsunamis that resulted in approximately 12,000 causalities in the Yaeyama Islands, the locations and focal mechanisms of these earthquakes continue to be debated. Studies of contemporary deformations observed by GNSS suggest a high degree of interplate locking along the Nankai Trough (Ito et al. ; Liu et al. ) in contrast to substantial creep along the Ryukyu Trench (Nishimura et al. ). These tectonic setting differences can probably be attributed to the frequency, size, and duration of slow earthquakes, including SSEs, in those areas. 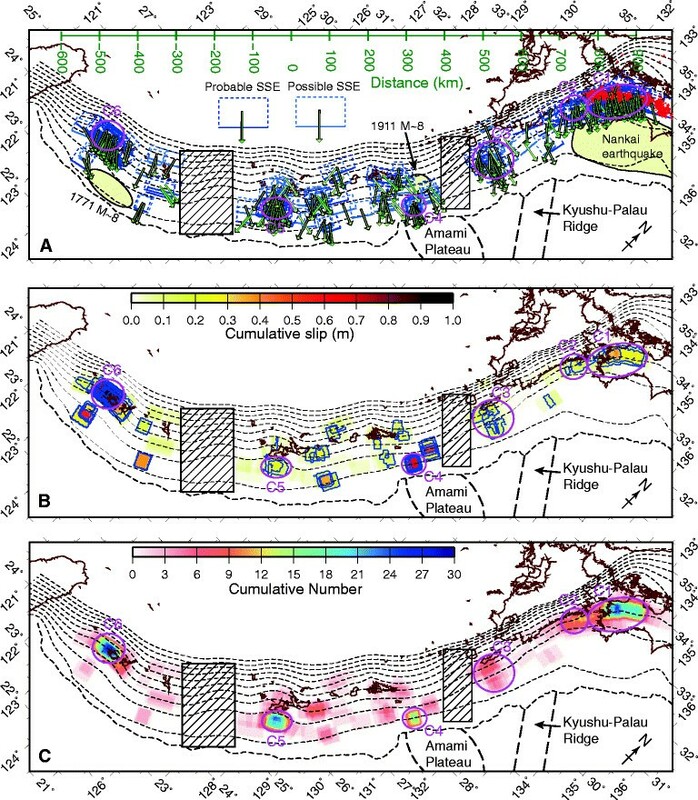 In this study, we attempt to identify the occurrences of short-term SSEs along the Ryukyu Trench by using GNSS data to detect the small episodic displacements caused by such events, after which we estimate fault models for short-term SSEs along both the Ryukyu Trench and western part of the Nankai Trough. We then discuss the regional characteristics of the detected SSEs. We used data obtained from the GNSS Earth Observation Network System (GEONET) operated by the Geospatial Information Authority of Japan (GSI) and daily coordinates from 3 October 1996 to 8 February 2014, under the so-called GSI F3 strategy for the GNSS baseline analysis (Nakagawa et al. ). The 352 continuous GNSS stations used in this study are indicated by the blue dots in southwestern Japan shown in Figure 1. The procedure used to detect short-term SSEs follows that of Nishimura et al. () with some modifications. We first removed the coseismic offsets of 14 large earthquakes with magnitudes ranging from 6.4 to 9.0, which were estimated from the 10 days averages of daily coordinates observed before and after the earthquakes. While the epicenters of 11 of the abovementioned earthquakes are plotted in Figure 1, those of the other three earthquakes, which include the M w 9.0 Tohoku-oki earthquake (e.g., Ozawa et al. ), are outside the figure area. The co-eruptive offsets of the Kirishima volcano from late January 2011 (e.g., Nakao et al. ) were also removed, along with anomalous noisy data that included large scatter and seasonal fluctuations for selected periods at some selected stations. Then, spatial filtering (Wdowinski et al. ) was applied to remove the common-mode bias for those stations. Because the spatial distribution of the stations used is as large as approximately 1,600 km, we found significant common-mode bias in the GNSS time series after performing simultaneous spatial filtering for all stations. Therefore, the GNSS stations were divided into two groups, north and south of N30°, after which spatial filtering was applied separately in each group in order to obtain noise-reduced coordinates. Next, we estimated day-by-day displacements of the north, east, and up components by fitting a linear function with an offset at the middle of a 180-day-long period. From the estimated offsets, we obtained three-dimensional (3D) daily displacement values from 1 January 1997 to 10 November 2013. To identify the signal related to short-term SSEs, we focused on the N45°W horizontal component, which is approximately parallel to the relative interplate motion along the Ryukyu Trench. Linear functions with and without an offset at the middle of a period were fitted to the N45°W component. Then, we determined which function was a better fit according to Akaike's information criterion (AIC) (Akaike ). The difference between the AICs (ΔAIC) of the two functions provides an index that can be used to indicate a significant displacement on a certain date. A zero ΔAIC value was assigned when the time series had a positive offset because SSEs are expected to cause a negative offset, which is opposite to the interplate motion. If a short-term SSE causes a significant displacement, the displacement should be observed simultaneously at nearby GNSS stations. This allowed the calculation of an average ΔAIC for the GNSS stations within a 160 × 70 km rectangular area. The long sides of these rectangular areas were oriented in the N45°W direction. Next, 141 points were selected at the center of the rectangular area in order to calculate these spatial average ΔAICs (Figure 2A), after which the points were projected onto the 35 km isodepth of the subducting Philippine Sea Plate at 10 km intervals on a N45°E-oriented line roughly parallel to the Ryukyu Trench. Figure 2B shows the average ΔAIC with time and distance along the trench. The average ΔAIC is only plotted at points corresponding to rectangular areas containing more than three GNSS stations. The vertical strips of low ΔAIC indicate that episodic displacement toward N135°E is spatially coherent along the trench, which indicates a possible candidate of short-term SSEs. The stars represent local minima of ΔAIC. In total, 374 minima were selected in accordance with the following criteria: (1) ΔAIC of less than −5; (2) the lowest ΔAIC in a time range of ±12 days, and a distance range of ±100 km. After dozens of trials, it was possible to determine the parameters that could be used to visually identify the signals. The color of the stars represents event classification based on the fault model estimation result. The vertical stripes and stars coincide with clusters of active LFEs in Shikoku and the Bungo Channel, which supports the hypothesis that the detected deformation is related to short-term SSEs (Nishimura et al. ). Spatio-temporal diagram of ΔAIC along the Ryukyu Trench. (A) Distance along the Ryukyu Trench. Broken lines are isodepth contours of the plate interface with a contour interval of 10 km. Yellow circles indicate central points of rectangular areas used to calculate average ΔAIC. (B) The stars indicate local minima of ΔAIC of -5 or lower. Blue, green, and purple stars are classified as probable short-term SSEs, possible short-term SSEs, and non-SSEs, respectively (see text). Sky blue dots represent occurrences of VLFs. After episodic displacement detection, a fault model for a short-term SSE was estimated from the 3D displacement. The GNSS stations selected for use in the fault model inversion were within a radius of 200 km from the points used for the average ΔAIC. We began by assuming a rectangular fault model in an elastic half-space (Okada ) and then applied the nonlinear inversion method formulated in Matsu'ura and Hasegawa (). Six rectangular fault parameters (i.e., longitude, latitude, length, width, rake, and slip amount) were the free parameters estimated in the inversion. A further three parameters (depth, strike, and dip) were assumed to depend solely on the horizontal location of the fault so that the rectangular fault would locate approximately on the subduction interface (Baba et al. ; Nakajima and Hasegawa ; Hirose et al. ; Hayes et al. ) (Figure 2A). We simultaneously estimated translation parameters for the north, east, and vertical components in the displacement data. The initial longitude and latitude parameters were those for the local ΔAIC minima point. The inversion results depend on initial parameter values because the inversion method uses a linearized iteration to solve a nonlinear problem. Additionally, in the method proposed by Matsu'ura and Hasegawa (), the parameters are constrained to be initial values as a priori information. The initial values for fault location at a depth of 35 km on the subducting plate are reasonable in the case of the Nankai Trough (Nishimura et al. ) because SSEs occur in a narrow LFT band at this depth. However, they are difficult to justify along the Ryukyu Trench because SSE locations are poorly understood there. Therefore, to reduce our dependency on the abovementioned initial values, we added an additional six sets of initial values for fault locations. The initial locations in the additional sets surround the original point for the local minima of ΔAIC at a radius of 70 km, located 60° apart. The other initial values used were 40 km, 35 km, 90°, and 10 mm for length, width, rake, and slip, respectively. Two criteria were used to classify each SSE model as a probable SSE, possible SSE, or non-SSE. The first criterion is the azimuth of the estimated slip vector. Because SSE slip vectors are expected to be approximately opposite to the relative plate motion, we chose events whose slip directions ranged between N90°E and N180°E. Other events were classified as non-SSE. The second criterion is how well the fault model explained the data. We calculated chi-square values representing nonconformist data for the fault model inversion and an inversion in order to estimate only translation parameters. The chi-square reduction was calculated by subtracting the chi-square for the fault model inversion from that for the translation parameter inversion. Finally, we compared the fault models estimated from seven initial values and chose the preferred model according to the largest chi-square reduction under the slip direction criterion. We then categorized events with chi-square reductions exceeding 30 and 100 into possible and probable SSEs, respectively. Figure 3 shows examples of estimated fault models that were classified as probable SSEs. When calculating SSE moment magnitudes, we assumed a rigidity of 40 GPa. Examples of estimated fault models for probable short-term SSEs. Black and white vectors indicate observed and calculated horizontal displacement, respectively. Yellow vectors represent estimated slip vectors. Blue broken rectangles indicate the estimated rectangular faults. Blue solid lines represent their upper edges. Orange and red circles indicate epicenters of regular and low-frequency earthquakes for the 5 days centering on the day indicated, respectively. (A) SSE in western Shikoku (B) SSE in mid Kyushu (C) SSE in mid-Kyushu (D) SSE southeast off Tanegashima (E) SSE east off Kikaijima (F) SSE in Okinoerabujima (G) SSE southeast off southern Okinawa Island (H) SSE in the Yaeyama Islands. However, it should be noted that even if the estimated fault models meet the criteria for probable or possible SSEs, false and missed SSE detections are unavoidable in this study because the detected displacement was approximately 2 mm and comparable, in most cases, to the noise level. Accordingly, we manually excluded some areas and events in order to make a reliable catalogue of short-term SSEs. For example, because the two hatched regions in Figure 4 are located far from the GNSS stations, even the M w ~ 7 SSEs in these regions may cause a very small (≤1 mm) displacement at the nearest station, which makes it difficult to determine whether the SSEs in these regions are real phenomena. Therefore, we excluded the SSEs identified in these regions. We also found several cases in which SSE models on the plate interface apparently fit coseismic displacement of intraplate earthquakes, including shallow crustal and normal-faulting earthquakes, and residual displacement after a correction of coseismic displacement for the 14 large earthquakes. In the end, we had manually excluded 21 probable and possible SSEs. Short-term SSE fault models in the studied area for a period of approximately 17 years. The hatched areas were excluded from the analysis because of the poor resolution in the used data. (A) Locations of estimated fault models. Broken rectangles indicate the estimated rectangular faults. Solid lines represent their upper edges. Green vectors represent slip vectors. Yellow shaded regions indicate source areas of past and anticipated megathrust earthquakes (Headquarters for Earthquake Research Promotion ; Nakamura ; Goto ). (B) Cumulative slip of the short-term SSEs. Blue lines are contours of cumulative slip with an interval of 10 cm. (C) Cumulative number of the short-term SSEs. In total, 130 probable and 93 possible short-term SSEs were identified from the period from 1 January 1997 to 10 November 2013. The parameters of each SSE are described in Additional file 1 of the online supplement. Figure 4 shows the fault models, cumulative slip, and the cumulative number of occurrences for all probable and possible SSEs along the Ryukyu Trench over the approximately 17-year period. We identified several clusters of short-term SSEs, which we named clusters C1 to C6 (Figure 4). The estimated moment magnitude for all identified SSEs ranges from 5.6 to 6.8 (Figure 5). These figures suggest that large short-term SSEs occur frequently along the Ryukyu Trench, which is in contrast with the Nankai Trough along which the largest event is M w 6.3 (Sekine et al. ; Nishimura et al. ). The largest SSE detected in this study is an event that occurred south of the Yaeyama Islands on 19 November 2004. However, there are large amounts of uncertainty in the estimated parameters of this event because it is located at the margin of the GNSS network we used. It is also notable that the uncertainties in the parameters for SSEs along the Ryukyu Trench are larger than those along the Nankai Trough because the GNSS network is less dense along the Ryukyu Trench and the SSEs here occur offshore, away from the GNSS stations. Figure 6 shows the spatio-temporal distribution of short-term SSEs along the trench. 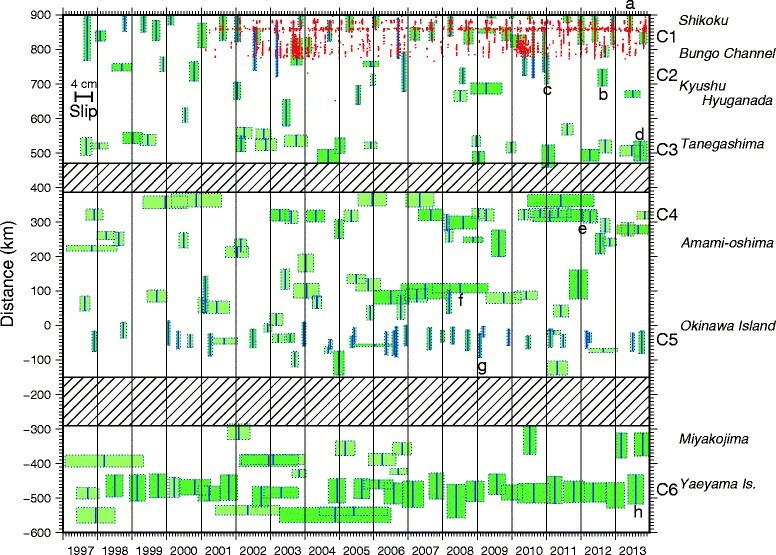 Each SSE is represented by a green or light-green rectangle with a vertical blue bar indicating the date of occurrence. The more extensive the space is filled by the green and light-green rectangles, the greater the interplate slip that was accommodated by the short-term SSEs (see Figure 6). We will discuss the characteristics of the detected short-term SSEs using these figures in the following sections. Histograms of moment magnitude of short-term SSEs. Solid and open bars indicate the numbers of occurrences of probable and possible SSEs, respectively. The numbers of probable and all detected SSEs are plotted in the individual plots. (A) Entire region. (B) Cluster C1 in western Shikoku. (C) Cluster C2 in mid-Kyushu. (D) Cluster C3 near Tanegashima. (E) Cluster C4 northeast of Kikaijima. (F) Cluster C5 near southern Okinawa Island. (G) Cluster C6 in the Yaeyama Islands. Spatio-temporal distribution of short-term SSEs. Green and light-green rectangles show fault models of probable and possible short-term SSEs, respectively. The date and slip magnitude of each SSE are indicated by the vertical blue bars in the middle of the rectangles and the horizontal width of the rectangles, respectively. The vertical axis indicates extension of faults projected on the direction of N45°E. Letters a to h and C1 to C6 correspond to the fault models shown in Figure 3A,B,C,D,E,F,G,H and the SSE clusters, respectively. Red dots represent occurrences of VLFEs. Hatched areas were excluded from the analysis. Here, we provide an overview of some of the individual events shown in Figure 3. In western Shikoku and the Bungo Channel, the available LFE data indicates that short-term SSE always accompanies LFEs. Figure 3A shows an example of this ETS-type SSE. However, there are various relationships between the short-term SSEs and seismic activities, such as regular earthquakes, LFTs, LFEs, and VLFEs in the other regions. Short-term SSEs along the Ryukyu Trench, even those just southwest of the Bungo Channel, do not accompany LFEs, as shown Figure 3B,C. However, we recognized that some SSEs coincide with regular earthquakes. One example is the M w 6.4 SSE detected just beneath Okinoerabujima north of Okinawa Island on 6 July 2008 (Figure 3F). Since the F-net centroid moment tensor (CMT) catalogue (Fukuyama et al. ) shows that an M w 6.0 interplate earthquake, whose epicenter is plotted in Figure 3F, occurred on 8 July 2008, this event may be regarded as a coseismic and post-seismic slip rather than a short-term SSE. However, we classified this event as a probable SSE because the moment estimated in this study was approximately six times as large as the seismic moment of the CMT solution. The detected SSE occurred 2 days before the M w 6.0 earthquake, which is an insignificant time difference within the temporal uncertainty of the method used, i.e., less than a week (Nishimura et al. ). An SSE that occurred on 24 September 2013 (Figure 3D) coincides with a seismic swarm including a maximum M w 5.1 earthquake southeast of Tanegashima. The seismic swarm continued from early September to mid-October 2013. The estimated SSE moment is larger than that of the cumulative seismic activity moment by an order of magnitude. The seismic activity was probably triggered by the SSE, as in the case of the SSEs in the Boso Peninsula (Ozawa et al. ; Hirose et al. ). In this section, we discuss several individual clusters. A distinctive cluster of short-term SSEs (C4) is located northeast of Kikaijima in a very shallow (approximately 10 km) region near the trench. The cluster consists of 15 short-term SSEs in the 6.0 to 6.3 M w range. An example of the SSEs belonging to this cluster is shown in Figure 3E. The displacement at GNSS station 0731 in the eastern part of Kikaijima is eastward by approximately 3 mm and is much larger than those at other stations. The total slip for the approximately 17 years is 0.7 m, which is the second highest peak along the studied area. The intense short-term SSE activity seen in a very shallow region may be related to the topography of the subducting plate. 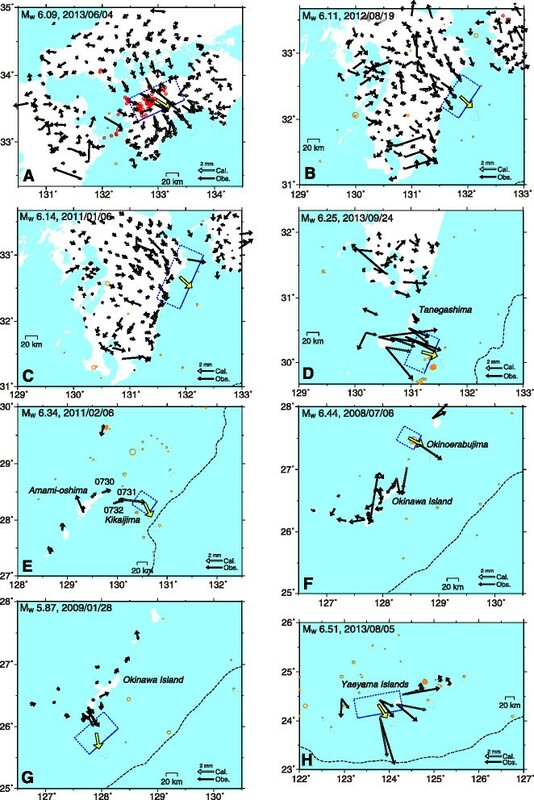 The Amami Plateau is subducting near Kikaijima (Figures 1B and 4), and the location of cluster C4 coincides with that of subducted seamounts, which are a part of the Amami Plateau (Nakazawa et al. ). Wang and Bilek (, ) proposed that the subducted seamounts cause creep, including SSEs, on the plate interface, which is concordant with our results. Next, we examined signals related to the short-term SSEs in daily coordinates of the GNSS stations on Kikaijima and Amami-oshima (Figure 7). We found that the downward offsets related to cluster C4 SSEs are clear in the daily coordinates at station 0731 and become smaller at stations 0732 and 0730. The daily coordinates, as well as the temporal distribution of the SSEs (Figure 6), indicate that the recurrence interval of the SSEs is irregular, varying from several months to a few years. We speculate that the irregular interval of the SSEs is not solely attributable to the limited detectability of SSEs, but is also due to the large diversity in the duration and magnitude of SSEs in the surrounding region. For example, the downward movement associated with SSEs is usually complete within a week, but the movement in August 2008 continued for more than 2 months (Figure 7). Furthermore, the slant between each short-term SSE is not constant and changes even during the inter-SSE period, which is clearly seen in the periods of May 2010 to October 2010, and June 2011 to January 2012. These observations suggest that various SSEs, with durations of days to years, occur in the region near Kikaijima. De-trended time series of selected GNSS stations in Kikaijima and Amami-oshima from 2008 to 2012. The horizontal N45°W component was plotted after removal of a linear trend for 1997 to 2013. Red and yellow vertical lines indicate the occurrence of cluster C4 SSEs and other nearby SSEs, respectively. Four-digit numbers represent GNSS station IDs. Their locations are shown in Figure 3F. An arrow indicates the occurrence of the M w 6.8 interplate earthquake whose epicenter is 120 km north of Kikaijima. The coseismic displacement of the earthquake is corrected. The SSEs of cluster C6 in the Yaeyama Islands correspond to the biannually repeating SSEs studied by Heki and Kataoka (). Our results also show that the SSEs continued to occur approximately every half year (Figure 6), even though three events in late 2003, mid-2004, and early 2007 were missed in this study. More specifically, this study detected episodic deformation related to two of these three events in the GNSS time series (Figure 2) but failed to estimate a reasonable fault model. The peak for cluster C6 SSEs in the magnitude histogram is M w 6.45 (Figure 5), which is the largest for all the clusters. From a total of 34 events with M w ≥ 6.4, 19 were cluster C6 SSEs. Cluster C6 in the Yaeyama Islands, therefore, consists of the largest short-term SSEs in southwestern Japan. A significant difference between our result and a previous study (Heki and Kataoka ) occurs in the estimated moment magnitude. The average medium magnitude estimated in that study was 6.6, which is larger than our estimate by M w 0.2. This difference is probably due to the fact that our detection method ignores SSE durations, which are a month on average. Fitting a linear function with a spontaneous offset to slow transient deformation causes the episodic displacement to be underestimated. Additionally, numerical experiments using synthetic time series suggest that our method underestimates transient displacement with duration of 20 days by 20% at maximum. The moment magnitude of this study, therefore, must be underestimated, and a similar underestimation probably occurred for other SSEs with durations of more than 2 weeks in the present study. In contrast with cluster C6, cluster C5 consists of 29 M w ≤ 6.0 SSEs (Figure 5F). This cluster is located southeast of southern Okinawa Island and includes the most frequently repeating SSEs along the Ryukyu Trench (Figures 4C and 6). An example of the SSEs in this cluster is shown in Figure 3G. Although the total number of cluster C5 SSEs is large, the cumulative slip for the approximately 17-year period is only 0.3 m at maximum, which is approximately 20% of the rigid interplate motion. Among the cluster C5 SSEs, we can recognize similarities in terms of magnitude, recurrence interval, and slip ratio between the short-term SSEs and the rigid plate motion, and the short-term SSEs in the ETS zone along the Nankai Trough. Although LFTs have never been detected along the Ryukyu Trench, VLFEs (e.g., Ito et al. ) have recently been discovered in the region (Ando et al. ; Asano et al. ). A preliminary study has suggested coincidental occurrences of short-term SSEs and VLFEs southeast off Okinawa Island (Y. Asano, personal communication, 2013), but further study will be required to clarify the relationship among slow earthquakes in other regions. Cluster C3 near Tanegashima consists of short-term 5.9 to 6.3 M w SSEs. Whereas clusters C4 to C6 consist of repeating SSEs whose source areas mostly overlap, the slip areas of cluster C3 SSEs are somewhat scattered. The short-term SSEs of cluster C3 tend to accompany nearby regular earthquake activities, as in the example discussed in the previous section (Figure 3D). The overall distribution of SSEs (Figure 4) suggests that short-term SSEs are common phenomena throughout the area from Shikoku to the Yaeyama Islands. It also indicates a degree of spatial heterogeneity, that is, short-term SSEs frequently occur in some areas but not in others. Although the observed heterogeneous SSE distribution is partly artificial due to inhomogeneous levels of detectability resulting from the GNSS network used, it must also reflect the true distribution of short-term SSEs. The total slip and number of SSEs vary along the east coast of Kyushu and the southeastern coast of Okinawa Island (Figure 4), even under a similar station distribution (Figure 1), which suggests that the true distribution of SSEs is not spatially equal. Most short-term SSEs occur at a depth of ≤50 km, but some exceptionally deep events occur along the Ryukyu Trench. One interesting feature is that a band of short-term SSEs in western Shikoku (cluster C1) extends to Kyushu through the Bungo Channel (cluster C2) in the same depth range (30 to 45 km), even though few LFEs or LFTs occur southwest of the Bungo Channel (Yoshioka et al. ; Yabe and Ide ). The total slip magnitude and total number of SSEs gradually decrease toward the south and diminish in southeastern Kyushu. Additionally, while short-term SSEs on the band become less frequent toward the south, several SSEs have been identified offshore beyond the band at a depth of ≤20 km. It is notable that this transition zone corresponds to the source area of the long-term SSEs (Figure 1, region B) (Yarai and Ozawa ), two 1996 earthquakes, and their afterslip (Yagi et al. ). The locking state of the interface estimated from the average GNSS velocity from 1996 to 2005 (Wallace et al. ) also shows a transition from full locking off Shikoku to significant creep off Kyushu. Park et al. () proposed that the subducted Kyushu-Palau Ridge controls the seismic slip behavior in this region. Considering the Kyushu-Palau Ridge and Amami Plateau along with the distribution of short-term SSEs, our study supports the hypothesis that the subducted plate topography controls the behavior of seismic and aseismic slip on the plate interface (e.g., Mochizuki et al. ; Wang and Bilek , ). The spatio-temporal distribution of the short-term SSEs (Figure 6) shows that several individual SSEs stretching from Shikoku to Kyushu caused LFEs in the Bungo Channel, but not in Kyushu. These events occurred frequently in 2003 and 2010, when long-term SSEs occurred in the Bungo Channel (Ozawa et al. ). The occurrence of short-term SSEs without LFEs and LFTs may not be surprising, because several such events have been observed previously, including those beneath the Boso Peninsula in central Japan (Ozawa et al. ) and in the Hikurangi subduction zone of New Zealand (Wallace et al. ). Even in tremor-genic ETS zones like the Nankai Trough and the Cascadia subduction zone, recent observations have detected some SSEs without LFEs and VLFs (Obara and Sekine ; Nishimura et al. ; Wech and Bartlow ). Since the depth ranges provide similar temperature and pressure conditions, within or outside the SSE fault zone, the important question is ‘What causes the difference between SSEs with LFEs and LFTs and those without in the same depth range?’ One possible answer is that the dip of the plate interface causes some stress state differences in the fault zone, because the plate interface in the SSE-genesis zone dips gently by approximately 10° in Shikoku and steeply by approximately 30° in Kyushu. Additionally, while Wech and Bartlow () suggested the hypothesis that the slip rate controls the occurrence of LFTs, this study is not capable of validating their hypothesis because SSE slip rate could not be estimated due to the limited temporal resolution in the low signal-to-noise ratio dataset. However, future studies on the temporal evolution of each SSE using tilt data with high temporal resolution (e.g., Hirose and Obara ) could provide clues clarifying the relation between SSEs and other slow earthquakes, including LFTs, LFEs, and VLFEs. Another interesting feature of the general SSE distribution is that many shallow SSEs with depths of ≤20 km were detected along the Ryukyu Trench, but no shallow SSEs were detected along the Nankai Trough south of Shikoku. The region in which no short-term SSEs were detected roughly coincides with that of the nearly full locking region estimated from the average GNSS velocity over a decade (Wallace et al. ; Liu et al. ). That region has also been regarded as the source area of the repeated M w ≥ 8 Nankai earthquakes (Headquarters for Earthquake Research Promotion ; Ishibashi ). The absence of short-term SSEs suggests that the region, except for the source area of the long-term SSEs (Figure 1, region A), steadily accumulates strain for future megathrust earthquakes along the Nankai Trough, although we cannot rule out significant creep and SSEs near the trough axis, which is a region that cannot be clarified by on-land GNSS data. In contrast, no space free from short-term SSEs with a spatial extent of more than 200 km exists along the Ryukyu Trench, except for the areas that we excluded in the analysis. Additionally, studies on average GNSS velocity show no evidence of interplate locking along the Ryukyu Trench (Nakamura ; Nishimura et al. ). These results suggest that aseismic slip accommodates most of the interplate motion and that the potential for a giant (M w ≥ 8.5) megathrust earthquake is low. Although the abundant SSEs detected in this study contribute to aseismic slip, the cumulative slip of the short-term SSEs is small and represents just a small part of the interplate slip (1.2 to 1.7 m) predicted from the global plate model (Sella et al. ) for the approximately 17-year period, except for clusters C4 and C6, whose total slips are approximately 1.4 and 0.7 m, respectively (Figure 4B). These observations suggest that steady creep and/or undetected long-term SSEs play an important role in accommodating the interplate motion along the Ryukyu Trench. Additionally, the source areas of the M w ~ 8 earthquakes that occurred in 1771 and 1911 do not overlap the distribution of the short-term SSEs. Even if these source areas are locked, it would be difficult to detect an offshore locked area of these sizes due to the sparsity of the GNSS network along the Ryukyu Trench. Accordingly, this study cannot rule out the potential for M w ~ 8 earthquakes like the ones that occurred in 1771 and 1911 along the Ryukyu Trench. This study clarified the spatial-temporal distribution of short-term SSEs on the interface of the subducting Philippine Sea Plate along the Ryukyu Trench from western Shikoku to the Yaeyama Islands of southwestern Japan. We then applied the short-term SSE detection method of Nishimura et al. (), with some modifications, using continuous GNSS data. Rectangular fault models for 130 probable and 93 possible SSEs were estimated on the plate interface from January 1997 to November 2013. The moment magnitude of the estimated fault models ranged from 5.6 to 6.8, although the value in this study may be underestimated for SSEs with durations of 2 weeks and longer. We found that the estimated short-term SSEs are distributed heterogeneously. If we assume that the SSEs occur on the plate interface, most are in the depth range of 10 to 60 km. Shallow SSEs with a depth of ≤20 km, which have been never detected along the Nankai Trough, are common along the Ryukyu Trench. Although short-term SSEs accompanied by LFEs and LFTs are concentrated in an ETS band along the Nankai Trough, SSEs without LFEs and LFTs form several clusters along the Ryukyu Trench. The SSE band extends from west Shikoku to mid-Kyushu across the Bungo Channel, whereas the LFEs and LFTs disappear at Kyushu. The SSE band diminishes in southeastern Kyushu, where the Kyushu-Palau Ridge subducts. We also found distinct SSE clusters southeast of southern Okinawa Island and northeast of Kikaijima. The former cluster consists of rather small SSEs with M w ≤ 6.0 at a depth of approximately 20 km, and the latter cluster consists of very shallow SSEs with M w of 5.9 to 6.3 at depths of approximately 10 km. The location of the latter cluster corresponds to subducted seamounts that are a part of the Amami Plateau. Our results suggest that the rough topography of the subducting plate may favor short-term SSEs on the shallow plate interface at a depth of ≤20 km. The author would like to thank the Geospatial Information Authority of Japan, the Japan Meteorological Agency, and the National Research Institute of Earth Science and Disaster Prevention for providing the GEONET, seismicity, and focal mechanism data, respectively. The author also extends thanks two the anonymous reviewers and Editor Teruyuki Kato for their thoughtful comments. Finally, the author would like to express his gratitude to Drs. Hitoshi Hirose, Kazushige Obara, and Ryoko Nakata who are conveners of the Japan Geoscience Union session on ‘Slow earthquakes’ for encouraging him to submit the paper to PEPS. This study was supported by the Tokyo Marine Kagami Memorial Foundation and the new disaster research project on megathrust earthquakes and Nankai/Ryukyu subduction zones.